The chemical shrinkage of hydrating Portland cement systems, the resulting bulk volume changes and the potential consequences for hydraulic isolation and well integrity in oil and gas wells will be addressed in a series of articles. In cement chemistry a special notation is often used to simplify the description of the cement compounds as many cement compounds can be expressed as a sum of oxides. Equations 1 and 2 represent the hydration of the silicate phases. 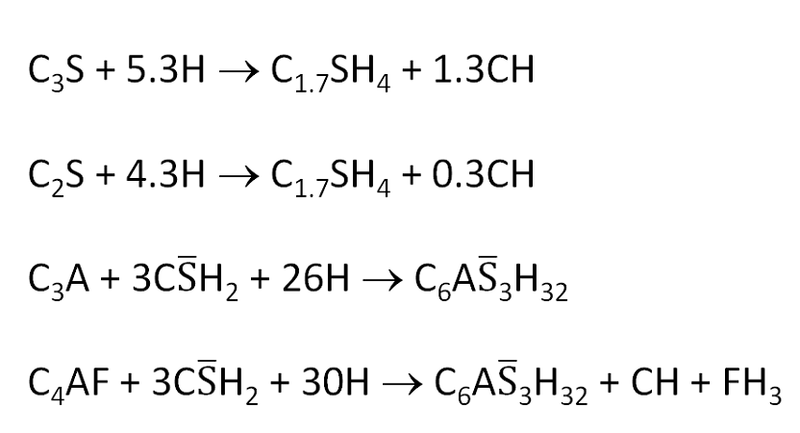 The composition of the calcium silicate hydrate, written as C1.7S̄H4 in this example, can vary significantly depending on the hydration conditions. CH is Portlandite. Equations 3 and 4 represent the hydration of the aluminate phases in the case where there is still excess of sulphate ions present, which is more likely at early times. The C6AS̄3H32 is ettringite.